Hybrid cattail (Typha X glauca) is a highly invasive species that has become a major threat to wetlands in North America. Last year I discovered in the PVC wetland some modest-sized patches of dense green cattails that I had never seen before. Craig Annen of Integrated Restorations quickly identified them as the hybrid and advised that we get rid of them forthwith. Unfortunately, it was too late in the season so we had to wait until this year. Now the patches have been dealt with, although this may not be the end of this species, since it could crop up elsewhere. Who knows how long it had been present before I noticed it? Hybrid cattail grows clonally from rhizomes and produces very dense patches, as the photos show. A new clone probably begins from a single plant, which spreads outwards in radial fashion. As it spreads, the growing circumference continues to enlarge. According to certain reports, it can spread linearly as much as 6 meters (18 feet) a year! Since the shape of the clone is approximately circular, one can use simple geometry to calculate the potential size of a clone. Starting with a single plant, in a year it would be 12 meters (~36 feet) in diameter with an area of 113 sq meters (~1200 sq feet). In general, growth is probably not that rapid, but even so, the mathematics show that in a very few years, given no impediments, hybrid cattail could eventually take over a whole wetland. 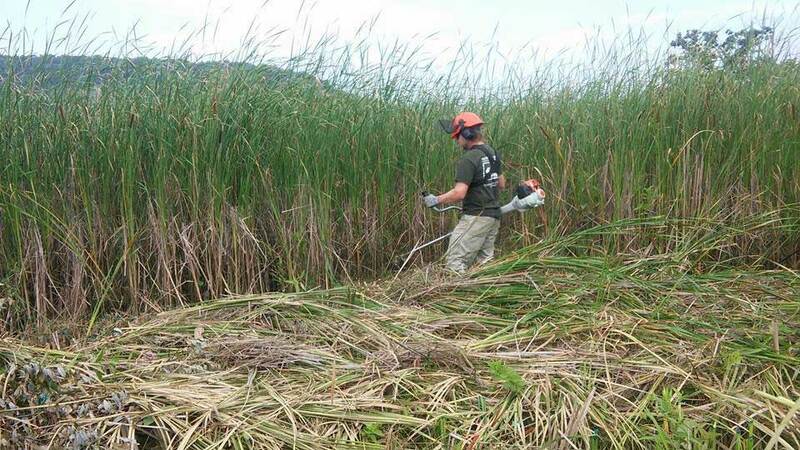 The control procedure was to mow the cattails with a powerful brush cutter and treat each cut stem with Imazapyr, an herbicide certified for wetlands. It took three workers with backpack sprayers following along behind the cutter to find and treat all the cut stems. The cutting was done in such a way that the new cut stems fell upon areas that had already been treated. As the photos show, very heavy thatch is created, and research has shown that if the thatch is not removed, native species are unable to recolonize the area. Thus, we plan to do a burn before the end of the year. Late stage in removal of hybrid cattail. Close up of the brush cutter in action. Note the very heavy thatch, and the closeness of the stems. Typha X glauca arises as a genetic cross (the X means hybrid) between the native North American cattail T. latifolia and the European species T. angustifolia. The European species, recognized by its narrower leaves, is quite common in North America, although it has not been identified at PVC. When first found in Europe in the 19th century, T. glauca was considered a distinct species, but was later recognized as a hybrid. Although T. X glauca produces flowers, seeds may not be formed or are generally nonviable. According to the literature, Typha X glauca is widespread in North America and is often as important as the two parents in nutrient-rich disturbed wetlands in North America, especially in sites with rapid changes in water level or chemistry. Thus, beaver-induced flooding, which has been an occasional problem at PVC, may be partly responsible for its advent at PVC. If the seeds of hybrid cattail are nonviable, how does it spread? New plants can be established from rhizome fragments, and movement from one place to another may be by muskrats, beavers, sandhill cranes, or other animals. Work on the ecology of hybrid cattail in our area would be very useful. Tom, in partial answer to your question of how the hybrid cattails can spread, hybrid cattail has very low sterility but is not completely sterile. It is noteworthy that chromosomal studies of populations of hybrid cattail and its parents (the native broad-leaved and invasive narrow-leaved cattail) show that all these species have 2n = 30 chromosomes, suggesting that the hybridization occurs from haploid chromosome pairing (rather than from chromosome duplication/polyploidy). Flora of North America (volume 22:281) suggests that the narrow-leaved cattail can then backcross with hybrid cattail to form a series of introgressive hybrids that become more fertile with each successive backcross (as more T. angustifolia genetic material accumulates in the Fn introgressive hybrids). Nevertheless, it would be nice to have more chromosomal and DNA data collected from cattail populations across their ranges to add support to this hypothesis. Also, in addition to wildlife, rhizome fragments are spread by flooding and as contaminants in boats and vehicles.